Judge Ingrid L. Moll graduated in 1995 from Wheaton College with bachelor of arts degrees in Political Science and French, and earned her juris doctor in 1999 from the University of Connecticut School of Law, where she served as the Editor-in-Chief of the Connecticut Law Review. 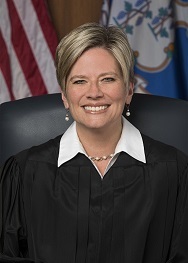 After graduating from law school, Judge Moll worked as a law clerk for the late Connecticut Supreme Court Justice David M. Borden. Nominated by Governor Dannel P. Malloy, Judge Moll was appointed as a judge of the Appellate Court on May 3, 2018, after serving as a Superior Court judge since 2014. As a Superior Court judge, Judge Moll’s assignments included the criminal divisions in the Waterbury and New Britain Judicial Districts, as well as the civil division in the Hartford Judicial District. Most recently, she presided over one of the Complex Litigation Dockets, as well as a consolidated products liability docket, which comprised over 2,300 individual products liability cases. Judge Moll currently serves as the chair of the Judicial Branch’s Client Security Fund Committee, the co-chair of the Ebriefs Transition and Development Committee, and the co-chair of the Access to Justice Commission, whose charge is to promote access to justice for all people. She also serves on the Judicial Branch’s Judicial-Media Committee and Social Media Committee. Judge Moll recently completed nine years of service on the board of the Connecticut Bar Foundation, the organization that distributes IOLTA and other funding to legal services organizations representing Connecticut’s poor and that puts on programs that promote the rule of law. She also served as a Judicial Branch appointee on the Task Force to Improve Access to Legal Counsel in Civil Matters. In addition, Judge Moll is a past president of the University of Connecticut School of Law Alumni Association and a past president of the Oliver Ellsworth Inn of Court.